If your iPhone is what you use for storing and playing all your favorite music in the world, the combination of a dock and powerful external sound system must be pretty hard to resist. Indeed, renowned accessory makers and audio equipment brands have created slick docks that let you prop up your smartphone or tablet in a comfortable and secure position, playing music from it through a Bluetooth or wired connection and charging it via AC power. That's not all, though! These accessories are portable soundsystems that run on batteries and let you take them anywhere. Nomatter if its blasting music in the kitchen or on the go, the good sound quality, long battery life, and unquestionable portability of these accessories have you covered from nearly every angle! We've rounded up nine wondrous technological specimens of this type and a bonus accessory that will come in handy in some special occasions. Most of them are designed to work exclusively with iOS devices equipped with Lighting ports, although some are designed to not discriminate between smartphones and tablets from different manufacturers, as long as there's an USB connection or headphone out present. Take a look, music maniacs! If you aren't familiar with iLuv, you'd be pleased to know the brand has amassed a total of 16 prestigious CES Innovations awards since its inception in 1997. It is headquartered in New York as a division of jWIN Electronics Corp. and all its products are conceived, designed and developed in New York. 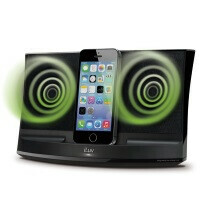 The iLuv Audio 5 is an attractive speaker dock meant to be the centerpiece of your room. It sound good, charges your iPhone, and features twin active drivers and passive radiator for deep, resonant bass. There's also a 3.5mm auxiliary input for direct connection to almost any audio device. The dock has top-mounted Power, Play/Pause, Track change and Volume touch controls for easy and convenient control. LuguLake's Bluetooth Speaker is about enjoyable sound quality and a sleek, modern design. The aluminum base has a fine finish that's fingerprint-resistant and easily cleaned. It is compact and portable, making it easy to take with you when you are on the go. The speaker works with all Bluetooth-enabled devices, and a 3.5mm audio jack is available for non-connected ones. There are two 3-watt stereo speakers on it, whose output power is supposed to equal that of two 3-watt single Bluetooth speakers. This speaker stand doesn't charge your device, but is compatible with everything that has a headphone jack, as it uses a wired connection to its AUX input. Getting to the power switch on the back can be a little tricky, but that's a small inconvenience considering the sound quality is pretty good for a battery-operated device. The battery lasts for up to seven hours of playback, and although the stand isn't secured in any special way, it takes just a little bit of caution to prevent any smartphone or tablet falling accidents. The portable speaker dock is easy to pick up and carry anywhere. Sony has a 40-watt audio system which can last for up to 7 hours on battery power and gets tunes pumped to it from your iPhone, iPod or iPad via the Lightning connector or Bluetooth. You can also connect anything with a headphone out to its AUX input. There are also multiple sound modes for different genres of music, and 20 FM radio presets. The dock features full-range speakers in addition to separate tweeters for a complete and enjoyable listening experience. It can also charge your device if's connected via Lighting and the dock is powered from an AC outlet. The dock works in tandem with the free Sony D-Sappli app for iOS, which enables expanded speaker functionality with Apple devices. The following features are available: an enlarged clock display, a music play timer, and a sleep timer. Bose gear is priced at the upper end of the spectrum, but that's not to say the premium isn't worth it. The SoundDock Series III lets one enjoy music from any iPod or iPhone with an Apple Lightning connector. It offers an unique combination of small size and sound performance. According to an user review, the Bose SoundDock "has the Bose quality sound you would expect". The included remote control is responsive and handles well. The dock has a small green LED which lights up when you press a button. You will be using the remote control for most essentual functions, and since there isn't an on/off switch on the unit, you're better of not losing that remote! The Aud 3 promises "the raw sound and energy of a concert into your living room". It's equipped with high-fidelity speakers and a passive bass radiator to create an impressive soundscape for the size and money. When your iPhone is docked, the Aud 3 provides the convenience of charging and playing music at the same time. The speaker dock features a sleek, elegant design and belongs in your living room, bedroom, or anywhere with you. Another offering from Bose, the SoundDock XT's compact design fits almost anywhere. Lightweight and taking up minimal space, the dock can be easily moved around and is available in two color schemes – White/Dark Gray or White/Yellow. The speaker charges your device whenever it's docked and plugged into a wall outlet, and features volume control buttons. A 3.5mm auxiliary port lets you connect other devices, such as a tablet, laptop, CD player or other mobile devices as well so you can get the most from your music. The JBL OnBeat Mini is a compact speaker dock that packs a serious audio punch with its two JBL full-range transducers and built-in signal processing which delivers a dynamic and rich sound. The JBL speaker dock lets you enjoy the music on your Lighting-equipped iPhone, iPad, and iPod Touch without adapters, and comes with an USB port for compatibility with other devices. The internal battery lasts for up to 8 hours of listening, and the dock charges your device when on AC power. Not only does the Phillips dock charge your device while blasting your favorite tunes, it boasts the company's wOOx bass enhancement technology. A pair of special speaker drivers works in harmony with the wOOx bass radiator, with precise tuning between the main driver and the tweeter ensuring smooth transitions from low-mid to high frequencies. By using the speaker box's full volume to magnify the impact of the music, the dual suspension system and totally symmetrical sandwich construction deliver low frequencies precisely, without distortion. There's also the Dynamic Bass Boost tech, which emphasizes the bass content of the music throughout the range of volume settings at the touch of a button! For example, bottom-end bass frequencies tend to get lost when the volume is set at a low level, and to counteract this, DBB can be switched on to boost bass levels, giving you a consistent sound even at low volume. The last one isn't a speaker stand, but rather a handy tool for owners of older Apple devices or accessories. This is audio adapter for a Lightning to 30-Pin connection, finished in classic Apple white. This way, you can connect your new iPhone to an older-gen speaker or docking station without adding unnecessary bulk or unsightly cables! Sep 27, 2015, 10:34 AM, by Nick T.
Mar 25, 2016, 11:07 AM, by Luis D.
I like the design of #7 BOSE.